Every huts’ settlement or village has its own well of bitter water for the survival of camels, goats, sheep etc. These animals have physically adjusted themselves to this kind of water. In summer this water is very cold and the animals drink it greedily. Such wells are 150 to 200 feet deep. Long rope and sizably large bucket is made up of animal skin. One end of the rope is firmly attached to the bucket whereas the other end is adjusted to the hump of a trained camel. Owner of every flock uses his own Camel to draw water from the well as manually it is not possible to undergo such hard job continuously for hours. Flock after flock take their turn on water and the process continues almost day and night. On our track we did not come across a village having two wells. As soon as the bucket touches the water surface below the well, it is filled manually and submerged inside the water in order to fill it completely up to its full capacity. The person on duty voices a sound which only the Camel understands. The Camel starts moving on the fixed track. As soon as the bucket is about a foot above the well’s wall, a second different special sound is voiced by which the Camel stops. The heavy bucket is pulled over to the well’s wall and poured into the small pond nearby, around which the animals gather for quenching their thirst. 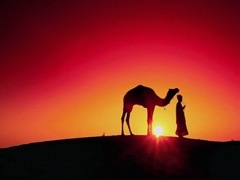 The empty bucket is lowered into the well and the Camel starts moving towards the well. The process continues till whole flock drinks to its fill. A man’s stomach gets disturbed with single glass of bitter water. Animals take it regularly without any complaint or trouble. Local people told us that the Camels’ milk also gets slightly saltish due to the bitter water. Inspite of that I had been stunned by the statement of a resident of Nagar Parker who said “I don’t understand why you do not drink such sweet water calling it bitter”. In local language well is called ‘Tar’ and flat sand fields are called ‘Tal’, whereas sand hills are called ‘Bhit’. In Tals we usually encountered groups of dears and sometimes rabbits jumping from bush to bush. Dears gave every indication of getting surprised to see us. They will stand still to see us then abruptly start jumping at full speed towards some hiding spot. At many locations we also saw partridge. Scenes of sunset and moon light at night have been especially blessed for the sandy deserts. Green fields and hilly areas are absolutely unfamiliar with such kind of attractive beauty. A person from irrigated areas feels himself to be inside another world on the globe. The tremendous calm is occasionally broken by the sounds of bells of some grazing animals far away. It is perhaps due to this peace filled calm and pure simplest food that people in the area very rarely get sick. Minor ailments are successfully treated by intake of specially processed garlic, onion, egg, spices or some natural bushes. God Almighty helps these people by miracles, otherwise there is no medical aid available near and far. ———– To be continued…..